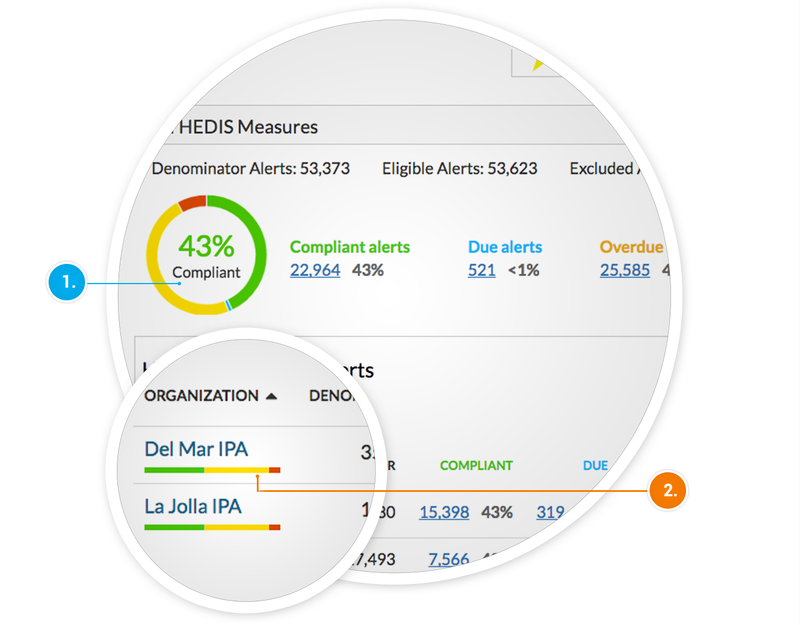 Interpreta's HEDIS® module provides continuous population updates on compliance and open gaps in NCQA™ HEDIS measures. Having up-to-date insight gives greater confidence and adaptability to constantly changing clinical conditions. This module provides an instant live view of performance on every measure, at an individual or organization level. Interpreta's prospective view provides a proactive approach to managing HEDIS-based care: clinical due dates and deadlines are automatically generated to prioritize outreach for every member. Donut chart shows the percent of compliant alerts, while the donut itself shows relative levels of compliant, due, overdue, and failed alerts. Stacked line chart shows relative levels of compliant, due, overdue, and failed alerts for a provider group, provider office, or provider. Interpreta's AMP module provides continuous population updates on compliance and open gaps in compliance with IHA's AMP (Align. Measure. Perform. formerly P4P) measures. Having up-to-date insights allows for greater confidence and adaptability to constantly changing clinical conditions. The module provides options to view performance on every measure at an individual member level or aggregated at either the provider or organization levels. Providers can use this information to identify low performers early in the year, to optimize clinical resource allocation. Interpreta's prospective view provides a proactive approach to managing AMP-based care. Measures are click enabled to focus on particular measures and both a stacked line chart and relative percentages of compliant, due, overdue, and failed alerts display to help users focus on the measures for a particular status. Interpreta's IHA STARS module provides continuous population updates on compliance and open gaps in compliance with a selection of CMS STARS measures. Having up-to-date insights allows for greater confidence and adaptability to constantly changing clinical conditions. The module provides options to view performance on every measure at an individual member level or aggregated at either the provider or organization levels. Providers and organizations use this information to identify low performers early in the year and, then, to help improve care delivery. Interpreta's prospective view provides a proactive approach to managing STARS-based care. Overall STARS rating for a measure displays next to the measure code. HEDIS® is a registered trademark of the National Committee for Quality Assurance (NCQA). NCQA Measure Certification℠ is a service mark of the National Committee for Quality Assurance (NCQA).